Located in the vicinity of the basilica of the Sacred-Heart and the vibrant “Montmartre Hill” district, the Hotel Boronali welcomes you in the heart of the “Village Ramey”, in a family-like setting. 36 rooms will offer you modern comfort in a homey atmosphere, and all of our team will remain at your entire disposal for your stay, to ensure a perfect Parisian experience. 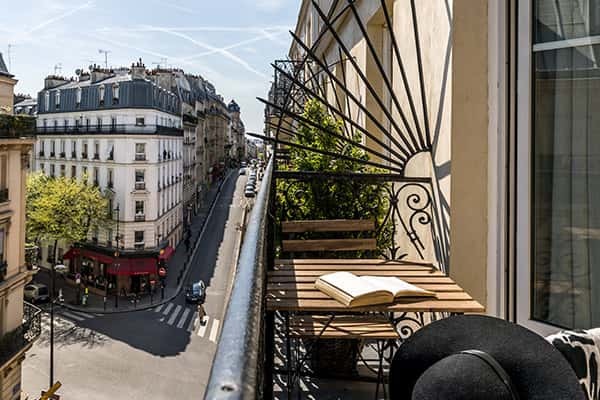 Live a unique Parisian experience ! We stayed only for 3 nights and it was great. the location is perfect. You can easily take a metro or go by walk to Eiffel, Louvre or Montmartre. As well, nig thank you for the staff! very helpful and nice. Apart from the tiniest lift in the world (LOL), our stay here was nothing short of superb. Fantastic service, and being in the heart of Montmartre was the icing on the cake. So close to everything you image Paris to be, you name it, we found it. I just completed a lovely stay at the Hotel Boronali. As other reviews have stated, the entire hotel staff is friendly and extremely helpful. The room, while small, was clean and comfortable. The dining room/lounge area is attractive and a pleasant ! I cannot recommend this hotel high enough, yes it is small and the lift is tiny; however, the service is above and beyond anything you would find in a 5* hotel. The reception staff saw to our every need and were so patient and kind. What’s a better option than Paris for your holiday shopping? Come and enjoy a winter in the capital with us; some offered delicacies will be waiting in your room. Real cocoons inviting to relaxation and rest, many rooms with modern comfort and elegant decoration await you. Hotel Boronali welcomes you for a memorable stay in Paris.